Let’s start 2016 with lots of new projects, shall we? I want to share my sewing plan for the new year, I’m not sure I’ll be able to make everything but I’ll try (lots of jersey so hopefully these will be fast). As you can see on the drawing, my color palette is pretty neutral this year. After reading the Wardrobe Architect serie on Coletterie last year, I’m trying (even if not always succeeding) to buy colors and patterns that will make sense in my current wardrobe. So in 2016, we’ll find: neutrals with grey, black and denim, lighter shades like white/cream/blush/safron and some touch of colors in the pink/purple/wine shades. For the silhouette, these are my classic everyday favorites: pencil or flare skirts, loose or fit & flare dresses, “not skinny” trousers and some loose tops/sweaters. 1. Loose sweater: I’m going to copy a sweater I bought last year and that I love to wear. The shape is similar to the Hemlock tee by Grainline but with tighter sleeves. Alameda skirt, another one (I wear mines at least once every week). 2. Camí dress: modified. No darts for a loose fit and buttons from top to bottom. In linen, that’s just perfect for summer. 3. Fraser sweater by Sewaholic (and the Ondée sweater by Deer&Doe for a more fitted style). 4. Seda dress: modified. Loose the shoulder yokes and try to make it in knit (Moneta style). 5. Bailén top in silk (in many different colors). Boyfriend jeans: Popcorn jeans by Blousette Rose. Birkin Flares jeans by Baste & Gather. I’ve already made a pair but need to repeat in a larger size (if I want to be able to eat, which is a nice option). I’ve said “no skinny” jeans as I don’t really like to wear them (even if the Ginger by Closet Case Files lloks great). And what can I say, I spent all my junior and high school years with flares and I loved the shape! What about you? What are you going to sew in 2016? Très jolis projets! Si seulement j'avais une liste aussi précise… Le Birkin Flare est définitivement dans mes projets. Enfin un patron de pantalon avec une forme selon mon coeur ! Je suis curieuse de savoir ce que tu ne penses. Et j'avoue que cette petite veste que tu nous concoctes me fait très très envie! Pour le reste… des coutures de basiques pour ma choupette et pour mon homme (dont une deuxième paire de Jutland pants de Thread Theory). Ah et puis une ou deux autres Carme en chambray!!!! Je te recommande le Birkin Flares, je vais faire ma deuxième paire (en partant sur une taille en plus au niveau de la ceinture). Je vous montrerai les photos bientôt! Merci Karine, si j'ai le temps moi aussi je ferai cette Camí modifiée en viscose 😉 Et pas de Rosarí dans ma liste car j'en ai déjà 5! j'attendais la sortie d'un patron de petite veste cintrée à porter avec un jean évasé, je suis donc dans les starting blocks ! A lovely plan for the year. 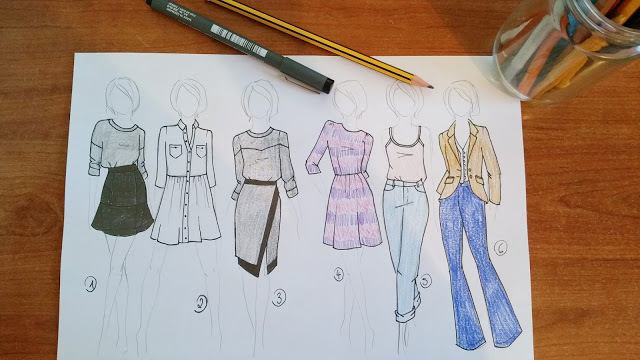 I would love to look as stylish as one of your drawn ladies, I find the flared jeans and jacket really lovely. I wish I was as stylish as the drawn ladies as well! The falred jeans are mazing, you should definitely check the pattern. Would you also PLEASE tell us how to modify the cami dress to make it loose fitting like in the sketch? Hi Melani, I was just thinking of not making the darts, that's all, but when I make it, I'll take pictures for a tutorial. Great sewing plans ! Looking forward to the new patterns, the silhouettes are very promising. qué buena pinta tiene ese spoiler en forma de falda 🙂 Besos! Jaja, me alegro que te guste! Quel coup de crayon! j'adore et en particulier la jupe en n°3 et la veste en n°6. J'ai hâte de voir ses nouveautés. Merci, j'ai en effet commencé par la veste, et j'en suis à la jupe aujourd'hui… mais il faudra attendre un petit peu pour les voir! Très chouettes projets ! J'aime beaucoup la cohérence de tes choix de couleurs. Moi qui ne suis pas hyper fan de jean boyfriends, là tu me tentes ! Comme quoi ! Merci Julie! J'essaie d'acheter moins de tonalités et d'imprimés forts et plus de neutres, c'est plus facile à associer plus tard. Je porte le boyfriend Popcorn aujourd'hui et il est très confortable, j'essaie de faire un post le plus vite possible pour en parler. Hello, What a lovely collection! I too have made sewing plans for 2016, and have already made 2 tops (including your great Bailen top). Can't wait for the new jacket pattern, I've already set aside some fabric for it! Thanks Elle. I just saw your Bailén top in cream, it's so pretty! Le plaisir est pour moi Annie! Ravie que les pièces te plaisent! Can't wait to see the Seda Dress! Thanks for featuring our fabric!